Set for your next big adventure? Ensure you don't miss out on any action in Macau City Centre by brushing up on a few things about it before you hurry off. Macau City Centre is a neighborhood in Macau. To reach it, travel 0.3 miles (0.5 kilometers) south of the center. Last time they counted, the population of Macau was 500,000. 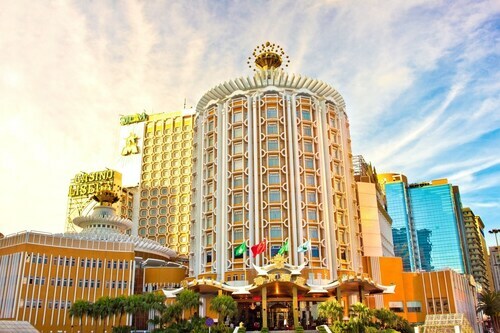 Purchase your Macau City Centre package deal via Travelocity, and watch how much money you save. 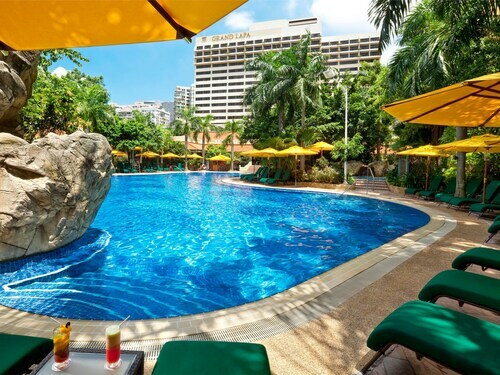 With no less than 400 airlines and 665,000 places to stay, you've got a world of options. From accommodations and airfares to activities and rental cars, we can give you 24/7 personal assistance with our Customer 1st Guarantee. If you happen to encounter an even better bargain on a different website, we will refund the difference^. We know that circumstances can change sometimes. If you ever have to change your bookings, you will not have to pay us a hidden fee. And as long as you get in quick, many accommodations don't charge extra fees either^. Wander wisely in Macau City Centre by staying nearby. This popular neighborhood features 36 properties to choose from within strolling distance. Some of the leading options in this area are the Mandarin Oriental, Macau (Avenida Dr Sun Yat Sen, NAPE) and the Grand Lisboa Macau (Avenida de Lisboa). There's a good selection of places to stay just a walk away from Senado Square. Book a room at the Wynn Macau or the MGM MACAU and you'll be able to enjoy the district at its best while being right in the heart of all the fun! Where do you fly into for Macau City Centre? Put your seat in the upright position, switch off the in-flight movie and get ready to arrive at Macau International Airport (MFM). Best part? You'll be only 3 miles (5 kilometers) to the southeast of Macau City Centre. Can I rent a car in Macau City Centre? Going off the beaten track is always a fantastic way to travel. So, why not do it from behind a steering wheel? Organize a rental vehicle via Travelocity and get set to crank up the tunes in Macau City Centre. If you're looking for a ride from Macau International Airport, unfortunately, there aren't any car rental outlets at the terminal. You'll have to find other means of transportation to journey into town, 3 miles (5 kilometers) away. If you decide to set up camp in Macau City Centre, you'll have stacks of time to look around the famous attractions, Senado Square and the A-Ma Temple. They're within such easy reach of this neighborhood that they may as well be on the doorstep! 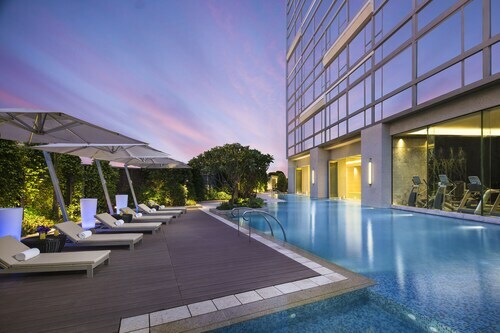 There's plenty to keep you busy in this lively neighborhood. Noteworthy attractions like the Museum of Macau and Guia Fortress are just a stone's throw away. Try to envisage the troops who once looked out from Fortaleza do Monte. The violence of past combats are still etched on its formidable walls. Need more nearby options? See what life was like many years ago at Ruins of St. Paul's Cathedral. Markedly more than just a bunch of old stones, these leftovers of the past offer a fascinating insight into a bygone era. But that's not all. Temples have long invited pilgrims in search of divine enlightenment. Explore the holy site of Kun Iam Temple and have your own quiet reflection. Whether you want your adventure to be action-packed and exciting or chilled out and relaxing, there's one thing for sure — you'll have plenty of tales to tell when it's all over! Vacations give us the chance to see another part of the world. During your visit to Macau City Centre, treat yourself to a Full-Day Macau History & Casino Sightseeing Tour or a Macau Full-Day Excursion from Hong Kong. Itinerary not quite full? Zhuhai Gongbei is nearby and is a good place to spend a morning. It is approximately 2 miles (3 kilometers) away. 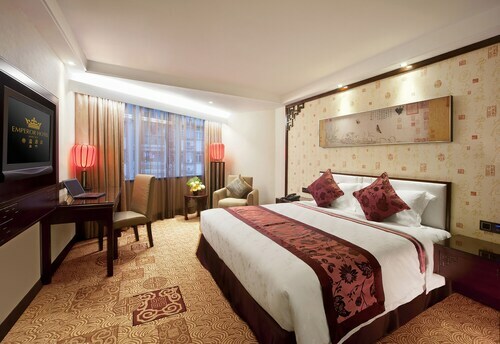 Centrally located in Macau, this family-friendly resort is within a 10-minute walk of Grand Prix Museum, Macau Fisherman's Wharf, and Sands Casino. Senado Square and Leal Senado are also within a 5 minute drive from the resort. 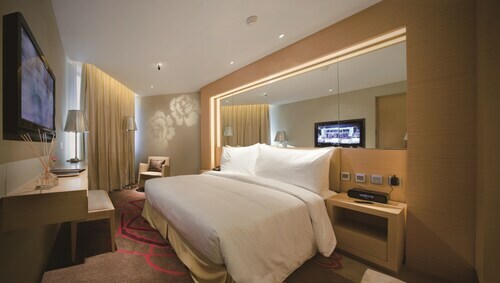 Situated in Macau, this hotel is within a 10-minute walk of Grand Prix Museum and Macau Fisherman's Wharf. Macau Ferry Terminal and Senado Square are also within 1 mi (2 km). 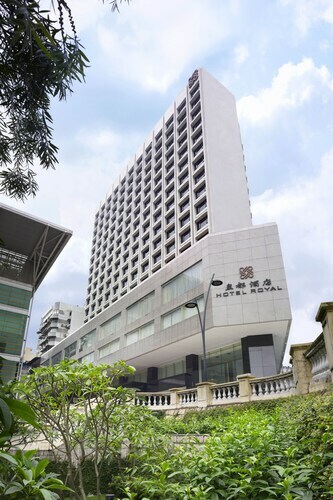 Located in the heart of Macau, this hotel is within 1 mi (2 km) of Statue of Guan Yin, Macau Tower, and Macau Fisherman's Wharf. Senado Square and Macau Ferry Terminal are also within 1 mi (2 km).